The title of today’s post is not at all meant to be derogative. I like Slow Cinema too much for a defamation of it. I also strongly believe that poverty does not necessarily harm creativity. On the contrary. I’ve been there during my childhood and my youth. You learn to make do with what you have, and this always requires creativity. A lot of filmmakers demonstrate the same thing. Without funding, or only minimal funding which doesn’t cover the production costs at all, some create remarkable films. Slow Cinema directors are known for this. Not all of them make something out of nothing. Some are a bit luckier with receiving financial support than others. Yet, the general situation is pretty bleak for slow-film directors when it comes to financial support. Those of you who have followed this blog from the beginning know that I’m always interested in looking into any possible roots of Slow Cinema. I do not agree with the current classification of being a descendant of Italian Neo-Realism. Nor with European modernist cinema in general. This approach is entirely focused on film, and shows the ongoing problem in academia: many researchers only think in their own fields instead of looking beyond their own horizons. Doing exactly this, though, shows just how rich Slow Cinema is, despite people’s persistent argument that there’s nothing to see, nothing to get out of. The films have a strong heritage in other art forms. I already spoke a bit about painting, and I still stand by what I said. Lav Diaz is not the only one who used to paint before he turned to filmmaking. 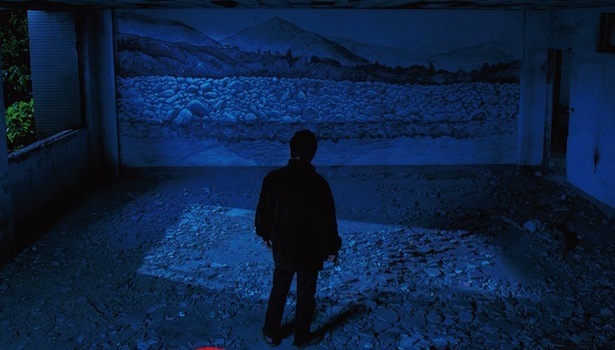 I think Apichatpong Weerasethakul used to paint as well (I think I read this in a recent interview). They may be an exception from the rule, but they make for an intriguing study of the ways in which Slow Cinema and other art forms converge. By way of diversion, I have reached the field of theatre. It started with a book on Polish post-trauma theatre, which was superb and similar to what I’ve been writing about Lav Diaz’s films in my thesis. In fact, there were so many similarities that I was glad I hadn’t read the book before submitting my thesis. It could have led to the Homer Simpson “NO!” effect. I was particularly taken by the two theatre directors Jerzy Grotowski and Tadeusz Kantor. The latter’s “Theatre of Death” shows similarities to the three Lav Diaz films I have studied, but unfortunately cannot be applied to any other director I have studied so far in the context of Slow Cinema. But Grotowski is an interesting reference point. It was he who wrote the short but groundbreaking essay “Towards a poor theatre” in the mid-1960s. I want to highlight no more than two aspects of Grotowski’s theatre and his vision of what theatre should be like. I possibly do not have to go into detail about the overall aesthetic of a “poor” theatre. Everything is reduced to a minimum. Perhaps Tarr’s The Turin Horse (2011) may be a good example. Yet it’s by no means the prime example. In slow films, in general, the mise-en-scène is minimalistic. The frames have been emptied of distracting elements. Very often you only see the very basics. And that is, in fact, all you need. This is also what Grotowski thought. Reducing the mise-en-scene to a mere minimum, you’re left with two elements which need to be strong: space and acting. As far as space is concerned, I’m not just speaking about what is visible. In a film (or a theatre play for that matter) what is not visible, but present nevertheless, is immensely important, and is, in some cases, even what a film is about. I’d say that Apichatpong’s Cemetery of Splendour is a good example. If you reduce the mise-en-scene to a minimum, then you have, I believe, a lot more options you can play with, precisely because nothing is certain for the audience. Absent presence is a wonderful means to speak about loss, loneliness, death, longing, haunting – all those elements play a major role in Slow Cinema. A second element whose importance is heightened in a “poor” theatre is acting. Grotowski placed particular emphasis on acting. The actors/actresses were so important because they had to fill the gaps the mise-en-scene left them with. They had to embody a lot more than just a role. Now, in many slow films, the term “acting” is perhaps not ideal. Very often, non-professional “actors” are used. In several cases, they do not even act, but play themselves. They are themselves. In other cases, actors and actresses live their roles. They embody the person they are meant to be on-screen. Lav Diaz’s films are a superb example for this, especially Florentina Hubaldo, CTE (2012). Diaz’s films would fall apart if it wasn’t for the strong acting, for the at times breathtaking behaviour of actors and actresses who merge with their own selves. Grotowski advocated something for theatre which can today be detected in slow films, which, in fact, are main characteristics of Slow cinema. Once more, I do not believe that it is the long-take which is the main characteristic. This point is once more an example of the narrow thinking of certain scholars. There are similarities between the aesthetics of Slow Cinema and other art forms. These may not be the most known advocacies but that doesn’t mean that we shouldn’t take them into account when looking into the aesthetics of films. I’d be interested in knowing how many filmmakers consciously know about Grotowski and his poor theatre. It would be an interesting influence on films. I have seen all of Tsai’s films, apart from Rebels of the Neon God, which still sits comfortably on my watch list. The sad thing about this is the fact that I haven’t seen a single one of them on a big screen. I always wished to see one of his films in cinema. His cinematography is superb and particularly attractive for someone who loves the art of photography. I came close last year, but the organisers of the Glasgow Film Festival had to pull Tsai’s Walker because the print didn’t arrive in time. Slow film, slow print delivery. Patience is a virtue, so I was able to see a Tsai film on a big screen after all. It was a fabulous experience on the one hand, but mixed into this positive feeling was a pinch of sadness. First of all, Stray Dogs is in some ways different from his other films. There are, for instance, scenes set in nature – in a forest, with peaceful ambient background sounds. This isn’t Tsai and has never been Tsai. He has always been the only slow-film director who used the urban rather than the rural as a backdrop for his films. It therefore felt strange at times, but this was only the case because I was used to cramped spaces, deafening noises of the city, etc In fact, the nature shots – there is one in which the two children walk through a forest – worked well as a juxtaposition of city and nature. The sudden noises of the city following ambient nature sounds have a similar effect to Lav Diaz’s play with sound and silence in Florentina Hubaldo. It not only wakes up the viewer (in case s/he fell asleep). It is a comment on the suffocation in the city, a kind of suffocation Tsai’s characters have endured for over twenty years. Their endurance, as we can see throughout the film, has taken its toll. A lot of writing on Slow Cinema concerns the absence or lack of pretty much everything. The catch word is “nothing” in the debate of slow films. I don’t like the context in which the word “nothing” is used, because I think that there is a lot happening in slow films. We merely make the mistake of comparing them to action-driven Hollywood blockbusters, forgetting at the same time that slow films show the everyday, and that our lives are not action-driven Hollywood blockbusters. Nevertheless, I had the word “nothing” in my head throughout the film. It is perhaps better to use the term “emptiness” here. What struck me was the foregrounding of emptiness in Stray Dogs. Tsai’s characters have always been empty, searching for something. Emotions often ran high, but the problem was the set-up of human relationships. Somehow, all characters started off as being lonely, and ended up being lonely again. Stray Dogs stresses this very point. Lee Kang-sheng, Tsai’s long-time collaborator, has nothing left to show, or to do. There’s nothing left inside him. I found him to be an empty shell. A shadow of himself perhaps, understandable given his twenty-year ordeal as a character who just can’t find what he is looking for. Lee’s in a desperate, desolate shape, which makes you want to hug him after you spend so much time with him. If you have seen Tsai’s other films, you will miss the rather uplifting scenes of, at times, ridiculous musical numbers, such as in The Wayward Cloud. You will also miss the very subtle sense of humour built into films that leave not only the characters depressed at the end. This time, Tsai did not conceal anything. He tackles issues of poverty, loss, despair and hopelessness head on. This makes it a particularly painful watch if you’re used to his usual approach. I thought that Béla Tarr’s farewell film The Turin Horse was bleak. But Tsai topped the Hungarian master, and possibly himself. It is true, this film can only stand at the end of a career in feature-filmmaking. Tsai continues to work on his short films (the Walker series), but he has expressed his desire to retire from making feature films. At the Q&A with Tarr after the screening of The Turin Horse at the Edinburgh Film Festival, I remember that Tarr said there was nothing left to say. I agree with it wholeheartedly. I have the exact same feeling about Tsai’s Stray Dogs. Another film just wouldn’t make sense. The lead character of all of his films has reached the bottom of existence. Dragging him down more would be impossible. Tsai could choose a different lead actor and continue to make feature films, but he wouldn’t be Tsai if he did this. Stray Dogs contains several references to Tsai’s previous films. It felt like a compilation, a kind of “let’s bring the best of the best together for a final piece”. A Best-Of film, if you want, at least visually. I remember one high-angle shot over a park or something (my memory is fading), which looked exactly like the high-angle shot in Paris that appears in What Time Is It There? It was a visual journey through Tsai’s filmmaking. And indeed, visual it was. I found that Tsai topped himself in his cinematography this time. He was always one of my favourites with regards to cinematography. But Stray Dogs – oh my. I would have loved to take photographs, to be honest, but I would have probably been arrested. In fact, seeing this film gave me an idea for a journal article. Unfortunately, I don’t have the time for it right now. Here we are again: patience is a virtue. Stray Dogs is a powerful farewell from cinema. Tsai has certainly put the idea of slowness to the extreme in this film, especially at the end. It was a rather slow and therefore brutal parallel to Lee’s endurance in twenty-years as an empty character. The film leaves you empty, and in a way, it’s an emptiness that cannot and will never be filled with Tsai retiring from filmmaking. How is that for a zig-zag reference to The Hole? 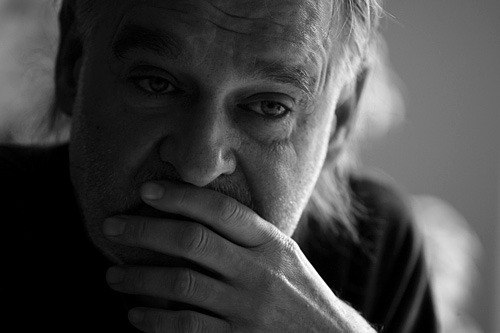 Kovács’ book is not the first book on Hungarian filmmaker Béla Tarr. Jacques Rancière has equally published a book, though rather slim, about Tarr, titled Le temps d’après (2011). It’s been available in English since last summer, I believe. Rancière’s book felt a bit like a quick shot attempt at writing about Tarr after he had announced his retirement from filmmaking. The good thing about this book was that it came close to catching the atmosphere of his films. At least it felt this way in the French language version. I haven’t had the chance to flick through the English version. András Bálint Kovács has published on Tarr before, mainly journal articles, which I was actually fond of, when I started my slow obsession. Kovács is a good friend of Tarr’s, and has, according to himself, shared the manuscript with the filmmaker before publication. When I read this, I thought that it must be a good piece of work, given that Tarr himself had a look over it. I was proven wrong. Kovács’s book encompasses Tarr’s entire oeuvre, from his early social realist films such as Family Nest (1977) and The Prefab People (1982) to his last two films The Man from London (2007) and The Turin Horse (2011). The book starts off well. It begins with a chapter on Tarr himself, which I found to be very interesting in parts. I’ve read extensively on him in the last couple of years, but there were still a few bits and pieces here and there that slipped through or that never came up in the stuff that I had read. Kovács then kind of chronologically moves from Style in the Early Years to style in his later works with a seemingly comprehensive study of characters, camera movement and everything you can think of. And this is the problem – everything you can think of. Kovács has tried to put literally everything into a 175 page book on the director. His analysis becomes more and more crammed toward the end, which made it extremely difficult to finish the book. He’s analysing eleven (slow!) films in roughly 150 pages, in all their details, of course. It feels as if Kovács didn’t want leave anything left for other people to write about. It feels as if he wrote this book in panic, which completely ruined the impression of Tarr’s films, which are the complete opposite of what I think Kovács has created in his book. I was always wary of writing about Tarr (and now, Lav Diaz), because I was worried that writing about him would take away the essence of his works. I wasn’t entirely wrong. Kovács’ book is a good example of how not to tackle Tarr’s oeuvre. If you read the book before having seen any of this films, it would probably put you off. This is mainly because of the extensive quantitative analysis Kovács has undertaken. In detail, he describes how often the girl in The Turin Horse takes up sewing, and how often her father takes a drink before seeing the dying horse. In detail, he describes how the shot length has steadily increased within Sátántángo (1994), making it a tedious read full of numbers and information that make Tarr’s films sound more boring than anything else. The problem is that Kovács has quantified Tarr’s style. He hasn’t managed to bring his films as such on paper. Kovács has put crude numbers and readings on paper that lack insight, which is astonishing giving their friendship. The reader is confronted with diagrams illustrating the “Rate of Moving Camera” or the ASL. Somewhere in this mix of numbers and diagrams, Kovács forgot to make the films look human in a way. There’s very little on the atmosphere in the films and the actual contents. Or even just the photographic beauty of the cinematography. I would have loved to see more insights, less detachment, less scientific analysis. Film is art, and while scientific analysis can be helpful, it is not the best way to conquer an entire oeuvre by one of the most prolific directors in arthouse cinema. If you tell someone that Lav Diaz’s films are six hours long or more, they laugh at you. Only if you tell them what the films are about, they become curious. If you read Kovács’ book on Béla Tarr, they would be just as uninterested. If I hadn’t been familiar with Tarr’s work, this book would have put me off on page 50 already. This film has to be in this year’s advent calendar. 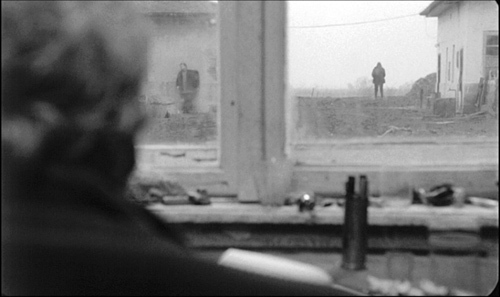 Bela Tarr’s The Man from London (2007) was the very first slow film I watched. It was the beginning of a deep love, and a slowly growing obsession. Re-watching the film brought up nice memories. The first scene, in particular, is something I will never forget. Not only because the lighting was so impressive, and the use of black-and-white was spot on. I sat on my sofa and waited for the first cut. I kept looking at my watch. I wasn’t impatient. If anything I was surprised that it was possible not to cut. You don’t exactly learn this with mainstream film. Cuts must be made, and must be made swiftly in order to keep the narrative going (and the audience awake). The intro lasts eleven minutes, and is exemplary of Tarr’s complaint that there is a kind of censorship going on if you use film rather than digital. Film would only ever get you to eleven minutes, then you have to cut. A curious, but at the same time valid statement, as I was to find out later when I came across Lav Diaz, a filmmaker using digital. With digital, he’s able to extend his shots, sometimes to twenty minutes and more. The Man from London is an adaptation of a Belgian novel of the same name by George Simenon. This makes Tarr stand out from other slow-film directors. Other works, such as his seven-hour epic Satantango (1994) and Werckmeister Harmonies (2000) were adaptations of works of his long-time Hungarian collaborator Laszlo Krasznahorkai. Tarr manages to extend the viewing time so that it’s not all too far away from the (book) reading time. Just as a writer gives time to his or her characters, he gives us time to study the screen characters and their development. There is thus a very intriguing link here to the time one spends (is allowed to spend) with a specific medium, and I suppose also how this shapes one’s impression of it. Black-and-white is used to perfection in the film, especially because many scenes are set at night, so that the whole darkness and all its connotations (evilness, danger, uncertainty) come through. It also helps to anonymise the surroundings. If you really wanted to, you could look up the shooting locations. But as Tarr pointed out in interviews, his films showed events that could happen anywhere anytime. Colours (by day) would make it easier to identify the location, and therefore link it inevitably to that certain location, which influences our reading of the film. The black-and-white allows for a more neutral reading of all of his films in general, and this film in particular. I could write a celebration of the many achievements of this film, which let my heart jump the first time and still does today. Kelemen as cinematographer gave the film a haunting feeling. The smoothness of the camera makes it feel as if there is a secret additional character, who is observing the events. It’s simply beautiful. And, even more so than The Turin Horse (2011), a wonderful photo album. And because of this, I will say no more, and let you take a look at some screenshots as well as an extract, which clearly demonstrates Kelemen’s superb cinematography. One last thing, though: Tarr explained that everyone on the set spoke a different language, and they didn’t need an interpreter. There you go – filmmaking, a universal language!